Mohan Krishna has been working with GHM Architects for approximately five years. He is a foreign trained architect from India. 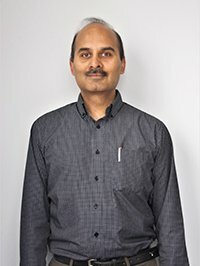 His 15 years of experience encompasses a wide variety of building designs, including commercial, schools, multi-family residential and industrial projects from Mumbai, and Bangalore to the Fraser Valley. He has also worked on a wide range of commercial interior projects for multinational corporations. His strengths lie in sensitively translating client requirements into functional, efficient and aesthetic design expression, with the ability to synthesize varied alternatives that generate dialogue and narrow down on a solution satisfactory to all parties concerned. The opportunity to touch, shape and better the lives of the end user at so many levels, is the driving force behind the passion for his work. He is a registered LEED®AP. Mohan’s favourite project was the new Maple Ridge Fire Hall No. 1. His interest in fire hall design prompted him to attend the Station Style Conference held recently in Kansas City. Station Style is a unique fire hall design conference, which is attended by Fire Chiefs and Architects from all over the US and Canada. It focused on different aspects of fire hall design, construction, operation and maintenance. Emerging trends and direction with respect to integrating sustainability, functionality and flexibility into fire hall design were presented and discussed in an open and interactive setting.